The RV64 is a SF6-gas insulated compact submersible unit with load break switch and earthing switches on both sides of the load break switch. So both sides of the unit can be earthed. There is an interlock between earthing switches and load break swith. The unit is submersible at a dept of 3 m. The manual opening of the load break switch can be performed when fully submersed. The unit serves for application at 12 kV with a nominal current of 200 A. There are sight glasses for the position indication of the switches. A gas density SF6 meter is present. 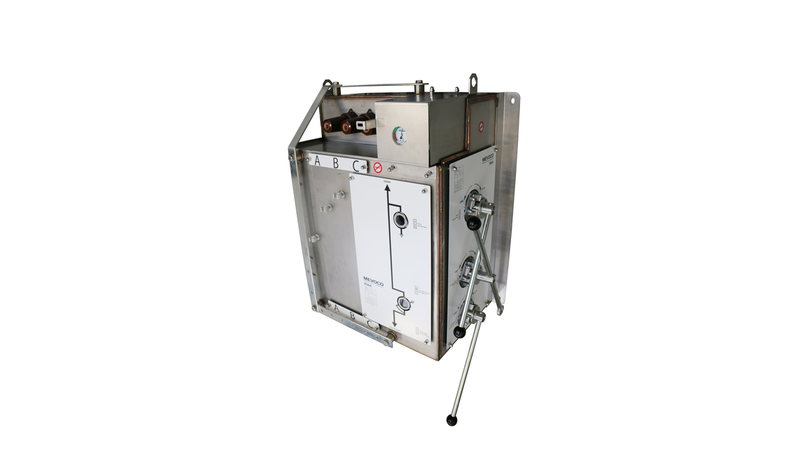 - Three-phase three position load break switch RV 50 of the class E3, M1 according to IEC 62271-103, 17,5 kV – 630 A – 20 kA and earthing switch with a making capacity of 50 kA. - Three-phase earthing switch RV 50 of the class E2, M1 according to IEC 62271-103, 17,5 kV – 630 A – 20 kA, with a making capacity of 50 kA. - Interlock between earthing switches and load break switch. - Stainless steel tank filled with SF6 at 0.15 MPa. - Maintenance friendly and fully integrated load break switch and earthing switches on both sides. - Both sides of the unit can be earthed. - Sight glasses for the position indication. - Gass density SF6 meter.